At a price of $100,000 this is hardly a unit for everyone, but it will certainly ensure that those who do wash in its luxuriant features are comprehensively clean in preparation of their daily duties. Featuring 18 heads, hence the name, this shower unit cleans you in every direction – literally from top to bottom – and, with adjustable temperature, water settings and other such features, it is certainly different from the normal showers out there. 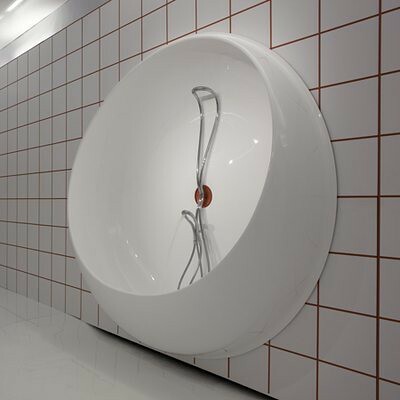 This curious conception from industrial designer, Ron Arad, involves a humongous basin looking unit tipped on its side, the user can then spin it round to either use as a bath in its curved section, or alternatively as a shower using the section which has a more open-lipped design. Unfortunately, this isn’t likely to replace the conventional showers we usually opt for anytime soon, as it is probably bigger than most people’s bathrooms! For those whose minds tends to drift off when taking their daily shower, this unit which features an aquarium built into the design – certain to give you something interesting to look at. Alternatives to an aquarium include a TV or Bookshelf, but unless your books happen to be waterproof that option might not be as cool. With a number of options available out there, this type of shower unit is accessible to anyone with a little extra cash to splash on their bathroom. 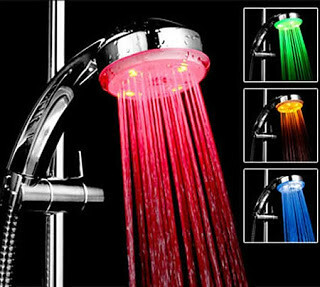 Typically featuring a traffic light system of sorts this type of lighting gives out warnings the water is cold with the colour blue, green means it’s all good and warm, whilst red means hot. Ok, so sometimes you’ll be out and about away from the home and the comfortable clean feeling your shower provides, maybe at a festival or out camping. What do you do for a shower in that case? 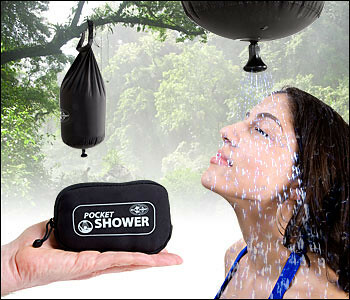 Well this handy pocket shower ditches the idea of units, shower heads and the like and instead provides you with a bag, capable of holding around ten litres of water no less. Even better, due to its thin black material and solar system it absorbs sunlight to warm the water – Sure, in the UK sunlight might be a rarity, but this is still nevertheless a cooler shower than most campers will have. For those lucky enough to take a shower in any of these units, the daily washing process is likely to be anything but boring! 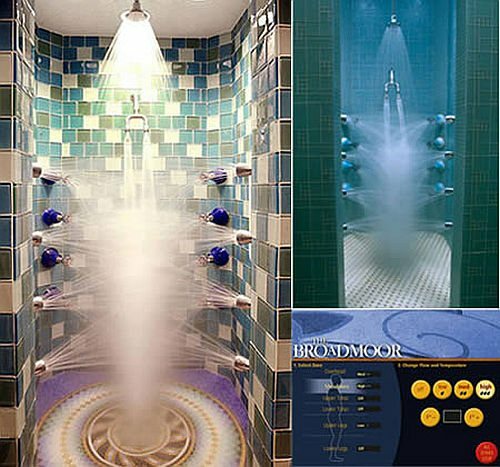 desc: This blog looks at a selection of five of the coolest showers currently out there for those looking for something a little different from the norm.